Two lead stories for you in this Leaflet – the launch of the search for the next President and Executive Director of Mass Hort and our mission-centric School Garden Conference on February 21. In its fifth year, the School Garden Conference is central to our education mission. This is the time to learn best practices for planning and running a garden that will not only meet educational goals, but also foster life skills. This is a must for educators, parents, volunteers and school and program administrators. Additionally, I am pleased to share with you the Position Announcement for our new executive. I encourage you to send us the names of persons you think would be good candidates for our President position and to share this announcement widely with others in your network that might know of strong candidates. You may forward your suggestions to Fin Perry , Mass Hort Trustee. On behalf of the board and staff, I thank you for all the support and encouragement you have given over the years to Massachusetts Horticultural Society. You have helped us develop an understanding of the importance of plants and our environment within our membership and the residents of our larger community. We trust this important partnership will continue and grow during our transition and well into the future. P.S. The Floral Design competition is still seeking entries for the Flower Show. It’s not too late to enter! Family Owl Walk—Not All Owls Say Whooo! We hope our members can join us for Mass Hort's Fifth Annual School Garden Conference ! On Thursday, February 21, Mass Hort will host this conference to explore regional best practices for planning and running a garden that will meet educational goals. Teachers, parents, school volunteers and administrators are encouraged to attend to discover ways to overcome challenges faced by new and established school gardens. This year’s roster of presenters includes Lara Lepionka of Backyard Growers delivering the keynote address, “No Time, No Money, No Help.” Presentations will inspire and share garden models that address common issues in creative and simple ways. Additional presentations will include workshops on composting, coordinating volunteer and class schedules, using harvested produce, connecting to classroom curricula, and developing an appreciation for the natural environment in students. Please join us at The Gardens at Elm Bank and please help share news of this fantastic event. Together we hope to cultivate garden spaces that will enrich every community! Registration includes refreshments and lunch. Memberships must be purchased by Friday, February 8. We have lots of exciting, new volunteer opportunities to fit your interests, skills and schedule! Online Auction Volunteers. We are looking for volunteers to help us plan and manage an online auction for Mass Hort in the coming months. It will be an exciting new fundraiser to raise much needed funds for Mass Hort's educational programs and gardens. For more information or to join the team, check out our sign up page here or email Amy Rodrigues, Mass Hort's Volunteer Engagement Manager, at arodrigues@masshort.org . Flower Show Volunteers. 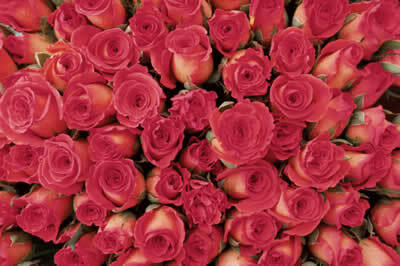 We need special event volunteers to make our exhibit and competitions at the Boston Flower Show a resounding success! This outreach opportunity - our largest of the year - helps us to connect to our many supporters and reach new ones. We need helpers to build, install and water our exhibit, to be ambassadors for Mass Hort and membership, help us guard the plants, and take on other tasks. If you are passionate about plants, love to talk to people or just want to learn what goes on behind the scenes of a flower show, please join us as a volunteer. Sign up here! Garden Volunteers. Greenhouse work and planning for next season's gardens is underway! Please join us at one of our upcoming Monday morning garden sessions . Be inspired by the natural world and enjoy the many benefits of volunteering with us in the warmth of the greenhouse or in the quiet of the gardens. Corporate volunteers. Can't volunteer? Use your connections and help us connect to corporate, school or community groups that would like to volunteer in the gardens this spring. We welcome groups of any size for a minimum of four hours Tuesday through Friday. For more information, please contact Amy Rodrigues at arodrigues@masshort.org . Mass Hort Members should receive their ticket(s) to the 2019 Boston Flower & Garden Show between February 20 - February 27. Need more tickets? Get a special Mass Hort Member discount - $18 per ticket. This is a limited time offer and payment must be received before March 1. Look for a special envelope included with Member ticket(s) or call 617-933-4961. It’s significant that we so rarely see one of my favorite flowering plants in home gardens. The reason is simple (and quite obvious): hybrid witch-hazel ( Hamamelis x intermedia ) starts and finishes its bloom well before most homeowners come to shop at their local garden center. That’s disappointing--few plants inspire such a welcome hope that our dreary winter weather will soon transform into spring. Most cultivars of the early-flowering hybrid witch-hazel ( Hamamelis x intermedia ) are the result of a marriage between the Japanese and Chinese species, H. japonica and H. mollis , exploiting the most appealing features of each species. Cultivars bloom profusely, even when young, in shades of yellow, orange and red, growing vigorously in full sun and normal garden soils, typically reaching 15 ft. high and wide after 10+ years. Resistant to deer browse, their exceptional blooms delight the viewer up close or at a distance. Their cut branches make superb late-winter flower arrangements; and in your yard, their blooms contrast appealingly against a background of evergreens, a dark-colored wall or the sky. For those who appreciate how remarkable horticulture can be, the genus Hamamelis uniquely monopolizes New England’s shoulder seasons: it offers flower color well-before (and significantly-after  ) the blooms of any other hardy flowering shrub. The Gardens at Elm Bank display a number of Hamamelis varieties and cultivars for visitors to enjoy. 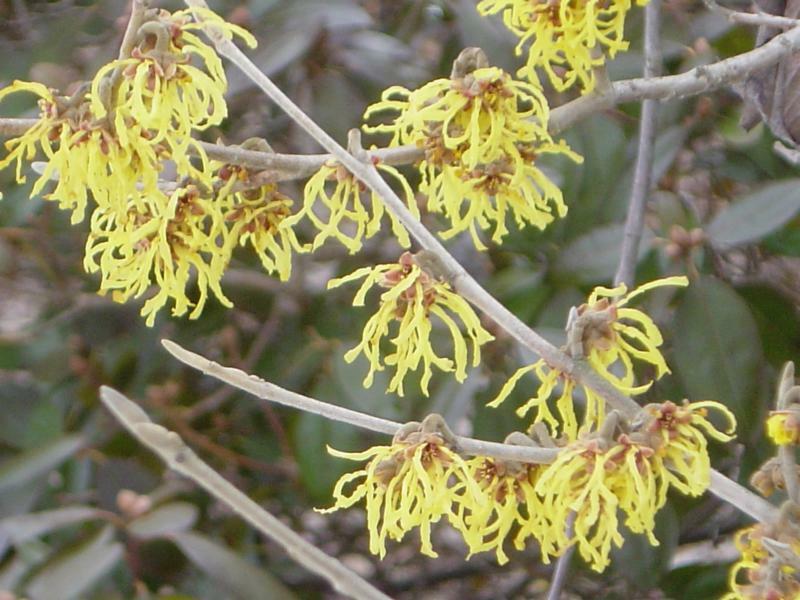 And an increasingly-wide selection of witch-hazel is now becoming available on the market; ask your local garden center about the types they offer. Witch-hazel’s native sister Hamamelis virginiana is a common woodland sight in November and into December, just as winter’s cold begins to set in. Wayne Mezitt is a third generation nurseryman and a Massachusetts Certified Horticulturist , now chairman of Weston Nurseries of Hopkinton and Chelmsford, MA, and owner of “ Hort-Sense ”, a horticultural advisory business; he currently serves as Trustee Chair for Massachusetts Horticultural Society. We know winter can make one feel stir-crazy, so we’ve planned some classes to explore New England, and the gardens of the world. On Tuesday, February 12, from 1 - 3:30 p.m., Sally Muspratt will lead an armchair trip through some amazing spaces, from Atlanta to the Loire Valley, as she revisits many exciting Travels with The Garden Conservancy . Join us for an afternoon slide show sure to be full of beautiful images of gardens in warmer seasons! Sign up here . For families of all ages, garden educator Kathi Gariepy will lead an Owl Walk on Tuesday, February 19, from 6:30 – 8 p.m. With puppets and activities, our guide will teach families about the habits and sounds of the owls of New England and then lead a walk outside to “look” for some of these nocturnal creatures. Free for children 12 and under. Sign up here . 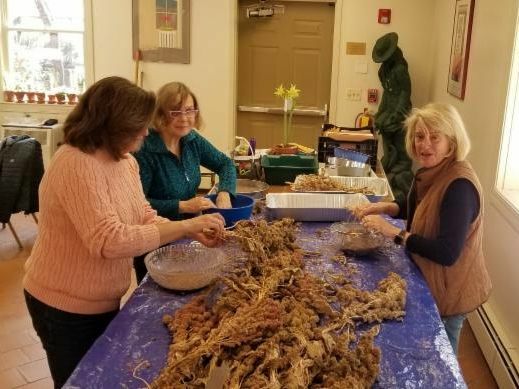 On Thursday, February 7, join Carrie Waterman for Learn How to Get Your Plants Ready for the Flower Show from 7 – 8:30 p.m. Waterman, horticulture judge and experienced exhibitor, will discuss what is needed to enter the competitions. Learn how to fill out an entry card and groom your plant(s) to get them ready for a horticulture show. Free for members/$5 general admission Register Here . On Tuesday, March 5, 1 – 3:30 p.m., Marisa McCoy and Nancy Costa (past and current design chairs) will review all you need to know to be successful and have a lot of fun as a floral design exhibitor in the program, How to Exhibit in a Flower Show & Enjoy It ! They will cover ways to prepare, how to find advisors, and how to easily get to the Boston Flower and Garden Show. This is a free workshop, sign up here . For those looking for a deep dive into a subject, we have two programs this month: The School Garden Conference , which you can read more about above. We also have Nan Rumpf’s one-day water color class, Dripped Wax Resist with Watercolor , on February 28 from noon to 4 p.m. Explore the exciting possibilities of combining melted wax with watercolor. Learn more and register here . We’ll soon be getting ready for spring, and Mass Hort is here to help you have a successful garden season. On Saturday, March 2, from 10 a.m. to noon, Senior Horticulturist Hannah Traggis will lead a Seed Starting Workshop to show you how to start your own seeds to take home for your garden. Register Here . 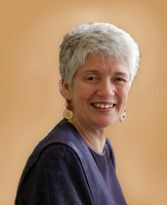 On Thursday, March 7 from 7 to 8:30 p.m. Garden Speaker Cheryl Monroe present Get Ready! The Spring Garden and cover important topics of the season such as: what to prune now and why, tool sharpening (demonstration and bring yours too! 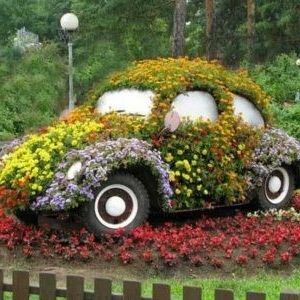 ), flower bed cleanup and evaluation, transplanting, lawn care, pest control (voles, winter moth, and scale), houseplant basics, bulb care, and bare root plants. Sign up here ! Intricate, intimate and interwoven; well-designed with an appreciation for craftsmanship and historical antecedents, the Arts and Crafts Movement revered simplicity, utility and a respect for local connections and the countryside. In a fragmented and dislocated world, its relevance could not be more important to the design of landscapes today. While the influence of the Arts and Crafts Movement on architecture and the decorative arts is widely studied, less so is the role that it played in the design of gardens. Enter garden historian Judith B. Tankard, whose immaculate scholarship and enduring passion for the period unites in the elegantly written and well-designed revised edition of Gardens of the Arts and Crafts Movement. Here, in a deftly presented, well-illustrated, and readable volume, she presents the gardens of the Arts and Crafts Movement within the broad context of art, architecture, interior design and the decorative arts, providing a baseline for ongoing study. Described as a short-lived but enlightened period of design, the Arts and Crafts Movement emerged in response to the design aesthetic of the Victorian era and the impact of industrialization on the social and physical environment. Promoting a reconnection to the natural world, traditional craftsmanship and a renewed appreciation for the manual trades, its goal was to make beautifully designed objects and environments accessible to all. At its epicenter was William Morris, poet, artist, philosopher, typographer, conservationist and political theorist. As Tankard notes, while "gardens never strayed far from his mind" an early biographer doubted, "whether he was ever seen with a spade in his hands." Nonetheless, Morris created seminal gardens at Red House, considered the first modern country house, and Kelmscott Manor. In both his commitment to honesty and beauty was evidenced in the integration of house and garden, representing a new approach to design. Profoundly influential, Morris inspired architects and designers, alike. Following his lead, a community comprised of both emerged in the west country region of the Cotswolds, where local materials, vernacular architecture, traditional crafts and the natural beauty of the countryside provided the perfect environment for the Arts and Crafts Movement to flourish. To illustrate the reach and influence of the Arts and Crafts Movement on garden design and regional planning, Tankard offers the reader a "highly personal" and expansive selection of houses and gardens in Great Britain and the United States to explore. More than 300 illustrations and photographs, including pen and ink drawings of garden plans done by Simon Dorrell, art editor of Hortus , complement the text. Chapters are devoted to the publications that popularized the Arts and Crafts Movement as well as the two "Master Gardeners," credited with promoting its style through their personal gardens and prolific writings - Gertrude Jekyll and Edward Robinson. Jekyll, whose partnership with architect Edwin Lutyens exemplified what is described as the most perfect example of the arts and crafts approach to garden making, lived at Munstead Wood, a likewise perfect expression of "the symbiotic nature of house and garden." Robinson, whose visits to the Hunnewell Estate, Mount Auburn Cemetery and Central Park left him "in awe of American gardeners" is remembered as the prophet of wild gardening. Perhaps one of the most refreshing aspects of Gardens of the Arts and Crafts Movement is Tankard's ability to present the Arts and Crafts Movement's legacy within a modern context, providing a direct link to garden designers of today. A chapter is devoted to contemporary gardens and designers, whose approach to gardening builds upon the philosophical tenants of the Arts and Crafts Movement in new and innovative ways. Should you be seeking design inspiration, you can find it in a chapter featuring examples honed from principles elemental to the Arts and Crafts garden. These include text on general layout ideas for small sites, enclosure, paths and paving, architectural features, garden ornament, small furnishings, water features, flower borders, climbers and roses, and naturalistic gardens. For those who wish to visit first-hand gardens from the period, a comprehensive listing of gardens in Great Britain and the United States is included. The Arts and Crafts Movement imagined a new definition of the garden as a harmonious and artistic element, integral to the design of both individual homes and communities. 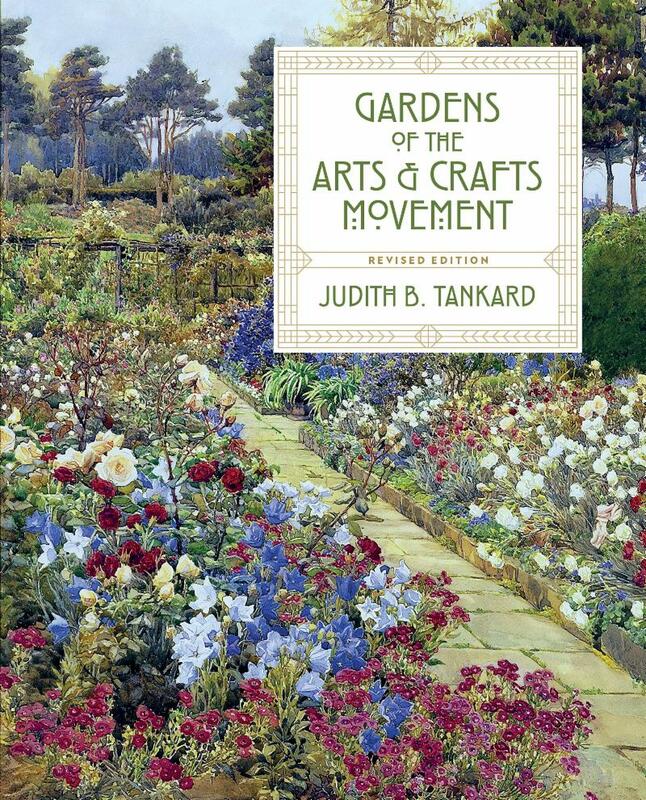 In Gardens of the Arts and Crafts Movement, Judith B. Tankard provides a compelling narrative in which to understand how this period of garden design remains relevant and important to how we design and interpret landscapes today. 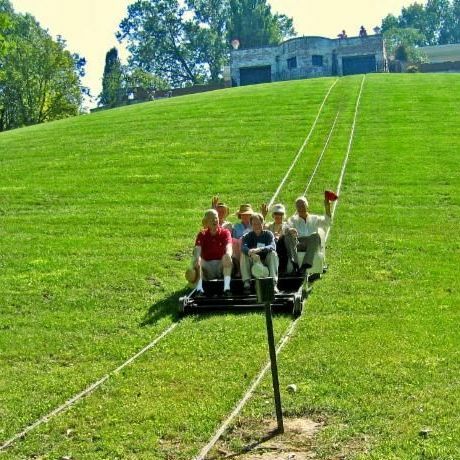 Patrice Todisco writes about gardens and parks at the award- winning blog, Landscape Notes. From its inception in 1829, the Society staged exhibitions and flower shows throughout the year that featured both seasonal flowers and fruits as well as arrangements of fruits and flowers by members and their spouses. Each year culminated with a grand annual exhibition in the fall that coincided with its anniversary celebrations. A multi-day spring flower show was instituted as an annual event in 1871 and continued for 137 years until 2008. The spring shows incorporated many of the features of the early exhibitions, although the emphasis was on seasonal plants and flowers. Today, “ Mass Hort at the Flower Show ” fulfills its mission to encourage the science and practice of horticulture and develop the public’s enjoyment, appreciation, and understanding of plants and the environment in managing the popular amateur competitions in floral design, horticulture, Ikebana and photography. The Library Archives maintains documents of past flower shows, that reveal the shows’ history. Some of most frequent research requests we receive relate to the Society’s flower shows ranging from who were the exhibitors or award winners and what was exhibited to what information we have on vendors at a show. It is interesting to peruse the programs and read not only about the exhibits, but also read about the other information therein. For instance, the 67 th Spring Flower Show was held in Mechanics Hall in Boston in 1938. The 25¢ program contained a detailed description of the exhibits, awards and participants. That show must have been splendid. Imagine, the exhibit by Mr. and Mrs. Van Beuren of Newport had 5,000 hardy lilies of 22 varieties, blooming among hardy perennials such as delphiniums and columbines! The show featured a sit down restaurant and soda bar, along with musical entertainment. Membership in the Society was $2 in 1938, the same as the Society’s fee in 1829. The program was well worth its price as it also contained extensive and informative articles on “Modern Architecture,” “Propagation of Wild Flowers,” “New Vegetables for the Home Gardener” and “Making a Rose Garden.” Advertisements reveal that one could enjoy a 7 course dinner for $1.50 at the Penthouse atop the Hotel Bradford or lunch for 50¢ at the Copley Square Hotel. 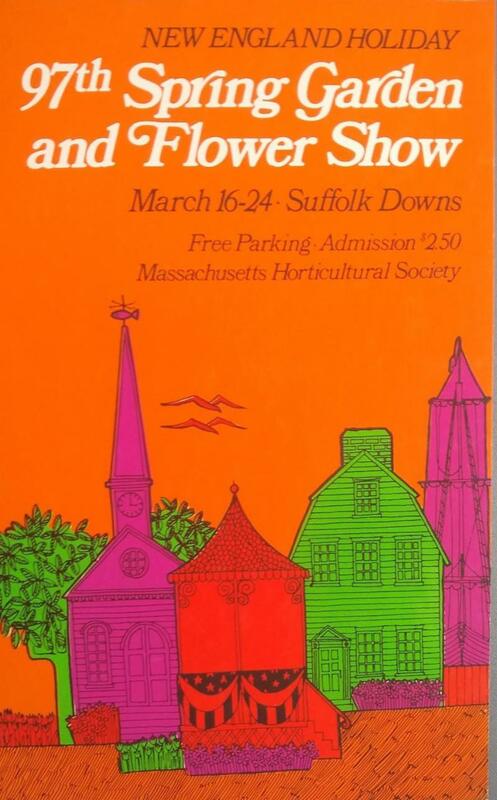 We are in the process of creating a Finding Aid for the Society’s Flower Show Collection that includes programs, posters, invitations, tickets and other ephemera. Cleaning out old memorabilia and records? Our most recent acquisition is a 1922 Exhibitor’s Admission Card found by a donor cleaning out a relative’s desk. As we have holes in our Flower Show Collection, we welcome many contributions of past flower show ephemera you may have. Please contact Library Manager Maureen O’Brien at mobrien@masshort.org for more information. Last month we discussed how nature can inspire people to choose a path in science. A recent 60 minutes segment profiled 81 year old Marshall Medoff, founder of Zyleco, Inc. in Wakefield, Massachusetts, and his work. Twenty-five years ago, Medoff became obsessed with the environment and went to Walden Pond for inspiration. He looked around and saw all the untapped cellulose in the plants and decided to abandon his business career and find a way to transform inedible plant life into environmentally friendly fuels, sugars and plastics in a clean and cost-effective way. Medoff succeeded and his cellulose based ethanol emits 77 percent less greenhouse gas emissions than regular corn ethanol. You can read and see the program here . The Library relies on the generosity of its members to build its Collections. This month we thank Caroline Whitney for her in-kind donation of books. We also thank Diane Bullock and Kristina Bezanson for their in-kind donations of books from the Society’s Amazon Wish List . My wife, Betty, and I took a much-needed and long-delayed vacation last month. Our original plan had been a month in New Zealand (where it’s midsummer), but, just four months after a total knee replacement, Betty’s surgeon advised against 20 hours on a plane and strenuous hiking. As it turned out, she made a remarkably swift and full recovery, but we made our January reservations in November. And so instead, we chose a week in London and a week in Paris. The forecast for London was chilly and damp. For Paris, it was chillier and with a chance of Yellow Vests. Expecting to be primarily indoors, we built our itinerary around a series of special art and culture exhibitions in those two cities. In all, we visited fifteen museums and galleries, several with those ‘once in a generation’ kind of blockbuster events. Why, then, did we keep ending up in gardens? It started in London. We walked everywhere and, England being England, we kept running into things in bloom. There were unexpected blooming irises in St. James Park. Millbank Garden, a long, narrow park opposite the Tate Britain beckoned with a pocket garden where daphne and camellias were in flower despite the short days and chilly nights. Part of our day was finding small, protected parks where tough, seasoned plants were showing their stuff. Park Crescent, at the southern tip of Regent’s Park, yielded a hedge with a white bottlebrush-type flower we could not identify. 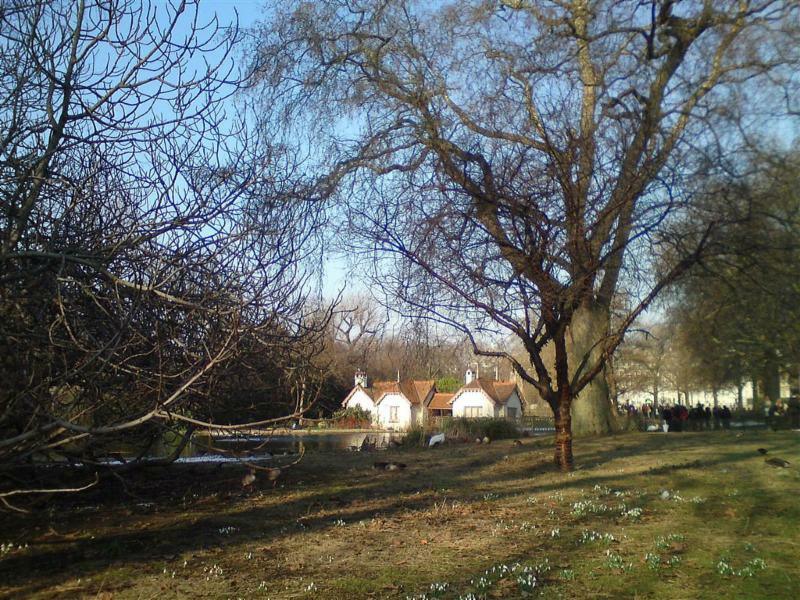 A winter vegetable garden valiantly hung on at the Duck Island Cottage opposite the Horse Guards Parade, and a scattering of Galanthus (snowdrops) bloomed nearby. Paris provided more unexpected gardens, albeit of a different kind. It was colder in Paris – not Boston-cold, but with daytime highs in the low 40s – and we were even greeted with a burst of sleet our first day. We spotted our first garden on the south side of the Notre Dame Cathedral, where a pair of large raised beds provided homes for cold-weather bedding plants like Stachys byzanta (lambs ear) and hellebores. Walking along the Seine on our way to the Musee d’Orsay, it seemed every houseboat on the river sported large boxes of brightly-colored flowers. The Marais district featured dozens of window boxes and a large weekend flower market. Can you really get a gardener out of the garden? I don’t think so. You can go to see art, but, in the end, you can’t stop also seeing all the color that nature unexpectedly surprises you with, even in the depths of winter. Neal Sanders is the author of twelve mysteries, most with horticultural themes. His next book will be published in March. They’re all available at Amazon and at bookstores. You can read more of Neal’s writing at www.thehardingtonpress.com . Winter has not been delightful. This has been an awful winter for your garden. First, there was no snow. Then, a modest snowfall was followed by freezing rain, ice, and sub-zero temperatures. Cross your fingers for more snow to act as an insulator to protect plant roots throughout the winter. If we have thaws, take the time to walk your garden and look for plants with exposed roots being pushed out of the ground by that freeze-thaw cycle. Push roots up back into the soil. If that is too difficult or impractical, cover the root mass with a thick layer of mulch or even potting mix to keep the plant alive until spring arrives. If you see any damage on the bark of young trees, wrap them with heavy duty paper or plastic to deter gnawing animals and to reduce any damage from winter sun. 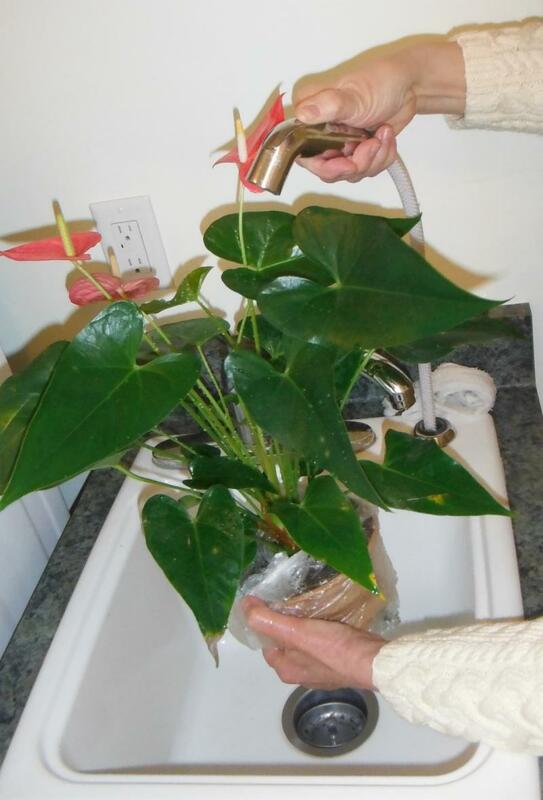 Celebrate Valentine’s Day by giving your houseplants a leaf wash. You can do this either by hand with a soft cloth, or in the sink or shower after covering the exposed soil with an old plastic bag. Why wash leaves? Clean leaves are more efficient at taking in sunshine – and they look nicer too. At the end of the month, it will be time to start fertilizing house plants again. Regular, but very weak solutions are better for plants than occasional heavy fertilizations. Cyclamens, orchids and cacti make great Valentine’s Day gifts that outlast cut flowers and are not demanding of a great deal of care. Nursery gift certificates may be an even better choice for a dedicated outdoor gardener. Pruning time. February is our snowiest month. Before the snow gets too deep, prune for shape, to control growth and to remove any storm-damaged limbs. You can prune grapes, most fruit trees and evergreens. Because you would be removing flower buds, don’t prune trees or shrubs that bloom in the spring unless you are doing so to remove damage. Now is also a great opportunity to cut down vines that are growing on trees. Even decorative vines can grow too large and too heavy for trees or even a trellis to support. And, if you have any Massachusetts-designated invasives such as oriental bittersweet, Japanese honeysuckle or mile-a-minute vine, cut them down, dig them out (if possible) and send them to the dump. Never try to compost these horticultural felons. Vacation planning . Use cold, snowy, miserable winter days to plan your trips to gardens during the warm months. There are gardens and historic gardens open for visitors in every state, state-wide garden tours such as the Historic Virginia Garden Tour and many, many garden club tours offered across the country throughout the spring. If you begin in the Deep South or Florida, you can explore those gardens now and keep going through the summer up in our Northern states. Start by Googling a date and an area and look for ‘garden tours 2019’. You’ll be surprised by how many results you’ll get. And don’t neglect established botanical gardens even if you’ve been there before. Gardens are like children, growing changing and surprising you every time you visit. Betty Sanders is a widely known speaker and writer on gardening topics. You can read more of her horticultural advice at www.BettyOnGardening.com.